7 months ago a Spirit Soul came to our family. She is the sweetest little Gopi. Her Name is Kamala Gopi. The last few months has been a rollercoaster. First months after the birth was tough. Not just physically but also mentally. Somehow I feel like I am slowly getting back to myself, although I will never be the same as I was, because now I am a mother. It is the most amazing gift in the whole world. I do understand how Prabhupada said that a mothers love to her child is the closest one gets to love of God. Its totally unconditional and its ever increasing. I also have a greater respekt for my own mother. She is an amazing person that brought up my brother and I with so much love. 7 months already. Now she is slowly starting to taste solid food. 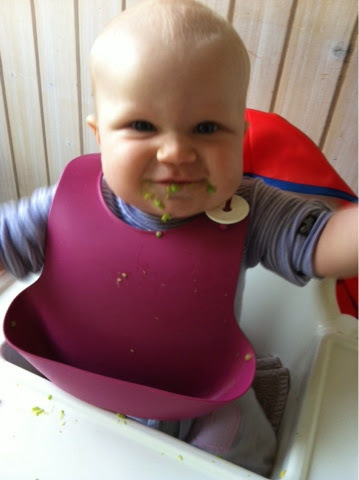 I am following baby lead weaning (BLW) so she eats whatever she can hold in her hand and put in her mouth. So far we have tried cucomber, paprika, apples, pear, broccoli, kael, tomato, avocado, watermelon, mango, melon, banana and sweetpotato. She eats it all!!! I finally feel ready to keep up my blog and I will make lots of pictures and recipies for vegetarian BLW. Stay true. Remember to chant. And be Krishna Conscious. Your kids copy you.